Ian Woodward's Investing Blog » The Forgotten Key Target! « Gone Fishing – Are you the Trout or the Fly? My good friend Maynard reminds me that in my last blog I forgot to mention one key target that has served us well in the past. 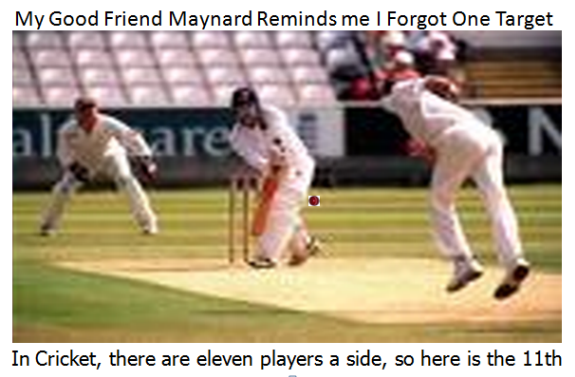 Since Cricket has eleven players, here is the 11th Man to keep an eye on in this tug-o-war between Bulls and Bears. 1. 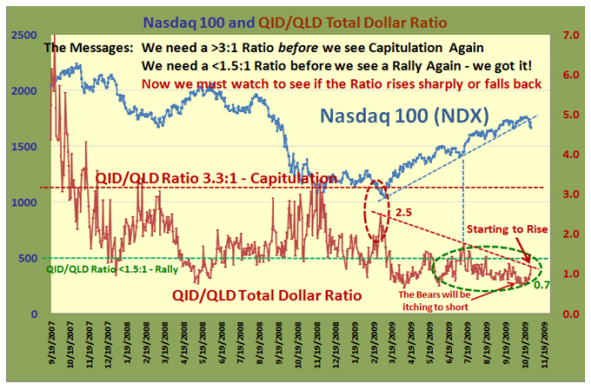 Note how quickly the QID/QLD Total Dollar Ratio rose rapidly from 1.0 to 2.5 as the NDX bottomed back in March 2009. 2. Then see how the ratio has remained dormant essentially below 1.5 for this entire rally, except again in mid year when all the Market Indexes swooned about 9% from High to Low. Note the dotted vertical blue line which shows that when the Bulls gained control again the ratio which had risen sharply fell back below 1.5. 3. Now once again, the Bears are rising from the ashes with the lowest ratio reaching 0.7 and ominously touching the down-trend-line from last March. The Target to watch is two fold; a) break above the line , and b) head rapidly for a reading of 1.5 for the Bears to win or fall back rapidly for the Bulls to gain control again. I’m sure you are saying “That’s all well and good, but I can’t keep track of these factors; life is too short, Ian.” You don’t have to, as I am sure what caught Maynard’s beady eyes was that the VOLUME on the QID on Friday rose to nearly 41 million shares, while the QLD by comparison had a paltry 18 million. The day previous the volume was 23M and 11M, respectively, but what we need to do is just keep an eye on the day to day volume more so than the price change at this stage of the game to see which way the wind is blowing. We must recognize that these instruments are also used as a hedge for one’s portfolio, but let’s see if this item can help us. Incidently, the last time the QID volume was above 41 Million shares was on July 23rd when it hit nearly 50 Million shares while the QLD was at 19 Million. The QID lost ground after that and the Bull Rally continued until now. 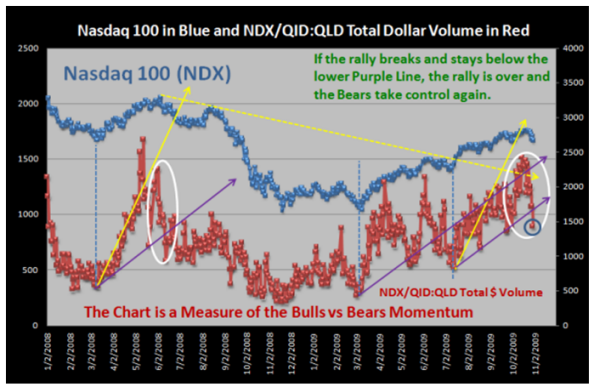 This one is more “loosey-goosey” where we divide the NDX by the QID:QLD Total Dollar Volume. However it has broken the lower trend line though not convincingly. This entry was posted on Sunday, November 1st, 2009 at 3:26 pm	and is filed under HGS Principles, Market Analysis. You can follow any responses to this entry through the RSS 2.0 feed. Both comments and pings are currently closed.